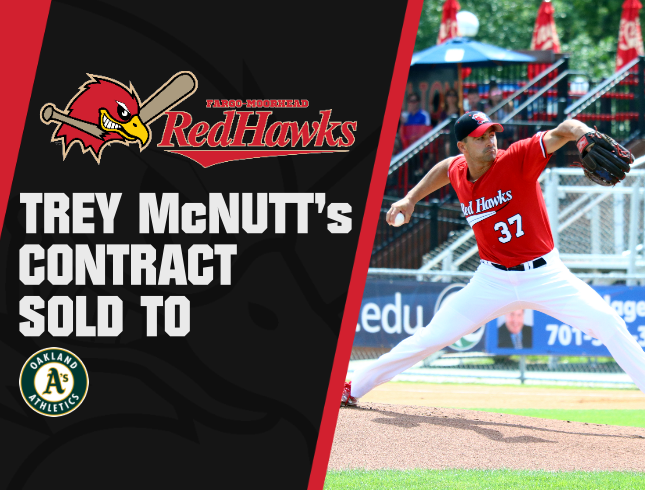 FARGO, ND — The Oakland Athletics have purchased the contract of Fargo-Moorhead RedHawks pitcher Trey McNutt. “I want to thank Michael (Schlact) and the rest of the RedHawks’ organization for my two seasons in Fargo,” said McNutt. “The coaches encouraged me to take away the excuses and focus on my goal of pitching for an MLB organization again”. “Trey has put in so much work and represented the F-M community and the RedHawks so well in his time here,” RedHawks manager Michael Schlact said. “He came to the RedHawks and put himself in an opportunity to be seen by MLB clubs, and put up numbers to get signed”. Schalct added “We’re so proud of Trey and all he accomplished and we wish him the best of luck & thank him for his contributions to the organization”.